George Campbell III, WR (Florida State): Campbell struggled once again with injuries, and when he was healthy, he played in seven games and ended with 4 catches for 42 yards on the year. Florida State went 5-7. 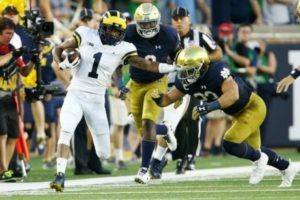 Shaun Crawford, CB (Notre Dame): Crawford missed the entire season with a torn ACL, the third ACL injury of his football career. Messiah DeWeaver, QB (East Mississippi Community College): DeWeaver completed 181/266 passes (68%) for 1,735 yards, 10 touchdowns, and 4 interceptions; he also ran 88 times for 110 yards (1.3 YPC) and 2 touchdowns. EMCC went 12-0 and won the NJCAA national championship. At the time of this 247 Sports article, he had scholarship offers to play for Akron, Bowling Green, Central Michigan, Louisiana-Lafayette, Ole Dominion, Southern Mississippi, and Toledo; he just announced on Twitter a couple days ago that he would be transferring to Old Dominion. Hit the jump for a bunch of other former commits. Kevin Doyle, QB (Arizona): Doyle is listed as a 6’3″, 210 lb. quarterback on Arizona’s roster, but he redshirted in 2018. Arizona went 5-7 under first-year coach Kevin Sumlin. Emil Ekiyor, OG (Alabama): Ekiyor is listed as a 6’3″, 342 lb. offensive lineman on Alabama’s roster. He only played in four games this season, preserving his redshirt. Jordan Elliott, DT (Missouri): Elliott made 24 tackles, 8 tackles for loss, 3 sacks, 1 forced fumble, and 1 pass breakup as Missouri went 8-5. Eric Gray, RB (Tennessee): Gray signed with Tennessee in December. Devery Hamilton, OT (Stanford): Hamilton started ten games for the Stanford Cardinal during their 9-4 season. Dele’ Harding, LB (Illinois): Harding made 37 tackles, 5 tackles for loss, 1 sack, and 1 forced fumble for the 4-8 Fighting Illini. 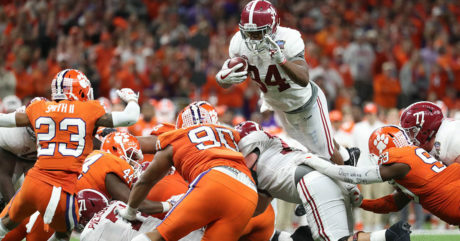 Damien Harris, RB (Alabama): Harris had 150 carries (a career-high) for 876 yards (5.8 YPC) and 9 touchdowns; he also caught 22 passes for 204 yards (9.3 yards/catch). Alabama went 14-1 and lost in the national championship game. Harris finishes his career with 477 carries and 3,070 yards (6.4 YPC) and 23 touchdowns, plus 52 receptions for 407 yards (7.8 yards/catch) and 2 touchdowns. NFL Draft Scout has him listed as the #2 running back in the 2019 class. Kai-Leon Herbert, OT (Miami): Listed as a 6’5″, 285 lb. offensive lineman, Herbert has played in one game during both of his seasons so far. Stephen Herron, Jr., DE (Stanford): Herron signed with Stanford in December. Jeremiah Holloman, WR (Georgia): Hollomon made 24 catches for 418 yards (17.4 yards/catch) and 5 touchdowns during his redshirt freshman season. Georgia went 11-3. Jalil Irvin, OG (Auburn): Irvin, a redshirt freshman, played in two games as a backup during the 2018 season and is listed as a 6’2″, 296 lb. offensive guard. Antwuan Johnson, LB (Bowling Green): Johnson redshirted as BGSU went 3-9. Dytarious Johnson, LB (Eastern Illinois): Johnson was second on the team with 78 tackles in 2018, along with making 15 tackles for loss, 1 sack, 1 interception (for 26 yards), 2 forced fumbles, and 1 pass breakup. Darrin Kirkland, Jr., LB (Tennessee): It was rumored that Kirkland was going to transfer prior to the 2018 season, but he ended up staying in Knoxville. As a redshirt junior, he made 51 tackles, 5 tackles for loss, 1 sack, 1 interception for a 33-yard touchdown, and 1 pass breakup. Chase Lasater, LB (FAU): Lasater made 2 tackles as Florida Atlantic went 5-7. David Reese II, LB (Florida): Reese, a 6’1″ and 248 lb. junior, made 77 tackles, 2.5 tackles for loss, and 1 fumble recovery during the Gators’ 10-3 season. Otis Reese, LB (Georgia): Reese made 13 tackles while playing sparingly for the 11-3 Bulldogs. Antwaine Richardson, S (Maryland): Richardson, a redshirt sophomore, turned into a starting strong safety for the Terrapins, making 41 tackles, 1.5 tackles for loss, 1 interceptions, and 2 pass breakups. Maryland went 5-7. Darian Roseboro, DE (North Carolina State): Roseboro’s last season saw him make 37 tackles, 7.5 tackles for loss, 1 sack, and 1 pass breakup for the 9-4 Wolfpack. He finished his career with 114 tackles, 31 tackles for loss, 14.5 sacks, 1 interception (returned for a 20-yard TD as a freshman), and 5 pass breakups. NFL Draft Scout ranks him as the #42 defensive end in the 2019 class. Erik Swenson, OT (Oklahoma): Swenson played in three games throughout the 2018 season for 13-1 Oklahoma. Garrett Taylor, S (Penn State): As a redshirt junior, Taylor became a starting strong safety, making 71 tackles, 2.5 tackles for loss, 3 interceptions (for 84 yards), 7 pass breakups, 1 forced fumble, and 1 fumble recovery. Penn State went 9-4. Leonard Taylor, TE (Cincinnati): As Cincinnati went 11-2, freshman tight end Taylor caught 3 passes for 31 yards. He’s listed as a 6’5″, 255-pounder. Rashad Weaver, DE (Pitt): Weaver became a force in 2018 for the Panthers, making 47 tackles, 14 tackles for loss, 6.5 sacks, 3 fumble recoveries, 2 forced fumbles, and 4 passes defensed as a backup. Pitt went 7-7 on the year. Michael Weber, RB (Ohio State): Weber ran 172 times for 954 yards (5.5 YPC) and 5 touchdowns as a senior, also catching 21 passes for 112 yards (5.3 yards/catch) and 1 touchdown. He finishes his college career with 455 carries for 2,676 yards (5.9 YPC) and 24 touchdowns; he also caught 54 passes for 297 yards (5.5 yards/catch) and 1 touchdown. Weber was ranked as the #2 running back in the 2020 class by NFL Draft Scout, though they have not ranked him with the 2019 guys, which they will have to do since he declared for this year’s draft. Tyrece Woods, DE: Woods remains undecided in the class of 2019. If you could have had any of these guys on the roster in 2018, who would it have been? I’d want Hamilton, every. Is he playing Tackle or Guard for the Cardinal? Hamilton was the starting left tackle for Stanford. Either Hamilton or Elliot would have had the most impact in 2018 IMO. Probably Hamilton though.